Acmhainn Cheol Dúchais Éireann i gcruth DVD-ROM is ea Pipe Up/ Lán Píbe. Na Píobairí Uilleann, eagraíocht na bpíobairí uilleann, a thionscain é agus é mar aidhm acu an bearna eolais a ghabhann le gléasanna cheol dúchais na hÉireann a líonadh agus leas á bhaint as an teicneolaíocht faisnéise is nua. Cuireann Pipe Up/ Lán Píbe i láthair do gach uirlis ar leith iomhánna ar ardcháilíocht agus samplaí físe agus éisteachta mar aon le comhad fíorais struchtúrtha. Fritheadh cabhair mhaoinithe chuige ó chlár Deis na Comhaire Ealaíon. Tá eagar curtha ar an taisce eolais in Pipe Up/ Lán Píbe d’fhonn freastal ar riachtanais dhaltaí bunscoile agus meánscoile nó, go deimhin, éinne gur mian leo cur lena gcuid eolais ar cheol dúchais na hÉireann. Mínítear ar Pipe Up/ Lán Píbe freisin na cineálacha éagsúla foinn agus tugtar deis dul i ngleic leo trí áis teagaisc nuálach don fheadóg stáin. Tá fáil ann ar rogha cleachtaithe simplí chomh maith le foinn a bheadh oiriúnach do bhun-, meán- agus ardleibhéal foghlama, agus is slí é an comhéadan mealltach soláimhsithe chun gur féidir leis an úsáideoir tabhairt faoi sheinm. Ceadaíonn an áis teagaisc Pipe Up/ Lán Píbe an fonn a sheinm níos tapa nó níos moille de réir mar is áil, agus tig freisin cliathnodaireacht nó nodaireacht ABC a chur ar taispeáint. Tá lear mór de leabhair ceoil agus de leabhair saothair ar fáil ann leis, agus tig an acmhainn a úsáid trí mheán na Gaeilge nó an Bhéarla. Is féidir Pipe Up/ Lán Píbe a rith ar Ríomhaire Pearsanta (PC), ar Mac, nó ar Chlár Bán, agus tá leas á bhaint ar bhealach sainiúil ann as an teicneolaíocht beochana idirghníomhach is nua ar mhaithe le hoidhreacht cheol dúchais na hÉireann a sheachadadh. 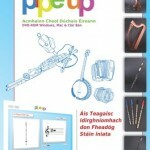 Pipe Up, an Irish Traditional Music Resource DVD-ROM, is produced by Na Píobairí Uilleann, the association of uilleann pipers, and aims to bridge the knowledge gap about Irish traditional instruments using the latest computer technology. With assistance from The Arts Council Deis funding programme, Pipe Up presents high quality images, audio and video samples along with a structured fact file for each instrument. 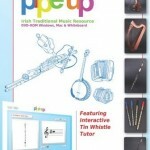 Information in the Pipe Up resource is presented in both Irish and English to meet the needs of primary and secondary level school students or indeed anyone wishing to learn more about Irish traditional music. Pipe Up also explains the various types of tunes and allows practical application via an innovative interactive tutor for the tin whistle. A selection of simple exercises, and beginner, intermediate and advanced tunes are included, and the user can play along via an attractive and easy-to-use animated interface. The Pipe Up interactive tutor allows the tune to be played faster or slower as required and also allows staff notation or simple ABCs to be displayed. A host of tune books and workbooks are also included and the resource can be used in either Irish or English. Pipe Up can be used on a PC or Mac or on a Whiteboard, and represents a unique use of the latest interactive animation technology for transmission of Ireland’s traditional music heritage.